How much information do you think you would need to change your financial life? How many classes would you need to take? Or how many counseling sessions would you need to have before you felt you could handle your personal finances? As a previous financial advisor, I met more than my fair share of clients that could have used hours and hours of my time and never really got their finances in order. So maybe simple is better. So let’s use this 3×5 card to advance your financial life. 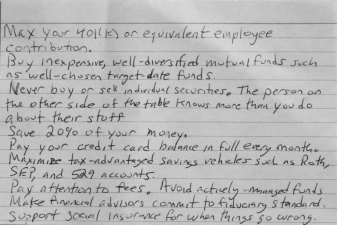 The card was written by University of Chicago Professor Harold Pollack who basically says that the best personal finance advice is simple and available for free at your local library. Max out your 401(k) or give enough to get the company match. Buy cheap diversified well-chosen mutual and target date funds. Don’t buy or sell individual stocks. The people on the other side know far more than you do about the investment. Save 20% of your pay. This is easiest done by saving 1% more after each raise that you get. Pay off the full credit card balance on your accounts every month. Roths, SEPS and 529 accounts help to maximize your tax advantages. Fees can eat away at profits. Pay attention to them. Keep your financial advisor on your side by understanding his fiduciary responsibility and making sure they’re upheld. Social Insurance is there when bad things happen, support this insurance. Use this 3×5 financial card to advance your financial life, it’s simple information, but very effective. The Secrets of The Millionaire Mind – T. Harv Eker shows us how to break our conditioning so that we can succeed in the future. It’s a great motivational book that puts you inside the head of many successful people. The best part is that the information is simple and an easy read. MONEY Master the Game – Tony Robbins-This Life Coach has been helping people around the world with everything from addiction to depression. Now let him show you in this book how to become the master of your money and not the other way around. Robbins takes you through 7 steps that will help you ensure your financial freedom for yourself and your family. Get A Financial Life – Author Beth Kobliner gives great advice to those in their 20s and 30s to help them get their finances in order. Beth is a leading personal financial advisor, so her work is solid and should be informative and eye-opening for those that need it. Could you use this 3×5 card to advance your financial life? If so, we want to hear about it in the comments below.